Mayor Crompton’s letter on the matter of climate change and oil company responsibilities, and Mr. McKay’s response, have been made public. Friends of Science Society is a group of earth, atmospheric, solar scientists, Professional Engineers and economists who have been reviewing climate science and policy since 2002. We are a non-profit society and do not represent any industry. Our objective is to provide the public with insights on climate and energy. This is the reason for our open letter. 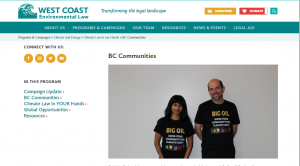 The website includes an image of people in t-shirts that claim: “Big Oil owes your community for climate costs.” As outlined in Mayor Crompton’s letter, much of the content of the Whistler letter parallels an example letter posted on-line at WCEL. According to WCEL’s website, the objective of such a letter is to alert an alleged climate change offender, make a demand, and then form a class action law suit. Listed on the WCEL website are several dozen environmental groups, all keen to join in. Many of them are also registered Canadian charities. Many have been funded by foreign foundations, as reported by Vivian Krause. In street parlance, this letter might be termed a shakedown. This appears to be a form of intimidation and extortion. In terms of climate science, both Whistler and West Coast Environmental Law have it wrong, as explained by Dr. Judith Curry in testimony to the US Senate, Jan. 16, 2014. As she explains, according to the Intergovernmental Panel on Climate Change (IPCC) in the 2013 AR5 report and in the Special Report on Extreme Weather, human influence is not considered a factor in extreme weather. 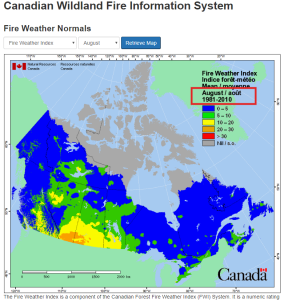 Claims that there will be an increase in wildfires is completely speculative. Last year’s wicked fire season was challenging for citizens and fire officials alike in BC, however some 400 of those fires were started by humans. The 30-year mean shows no trend. Whistler proudly claims to have hosted the 2010 Olympics while condemning oil companies for climate change, but there is a movement to stop all Olympics, precisely because of the wasteful use of fossil fuels, the carbon footprint, and the hypocrisy. This and Whistler’s claim to host some 3 million visitors a year only highlight the incredible gall of Whistler making a demand on an oil provider, while the end users are the ones who are creating all the emissions. We are interested in the Canada Revenue Agency Charities Directorate and the Competition Bureau looking into this case. We do not believe that such an attack on a legally authorized enterprise, in a highly regulated industry, should be launched by the incitement of a foreign-funded Canadian charity. This fails to meet the ‘net public benefit’ test. There is nothing ‘tangible’ (vis a vis the mandate of Canadian charities) about ‘climate change’ because climate change is a function of many different factors, not just human beings or their industrial emissions. It is a global, not local issue. Charities are supposed to serve tangible, measurable, local benefits – such as the Halifax food bank serving X number of hampers to Haligonians. These corporations employ hundreds of thousands of people, provide billions in tax dollars, a myriad of useful product streams, and make things like modern medicine and fly-ski vacation packages possible. 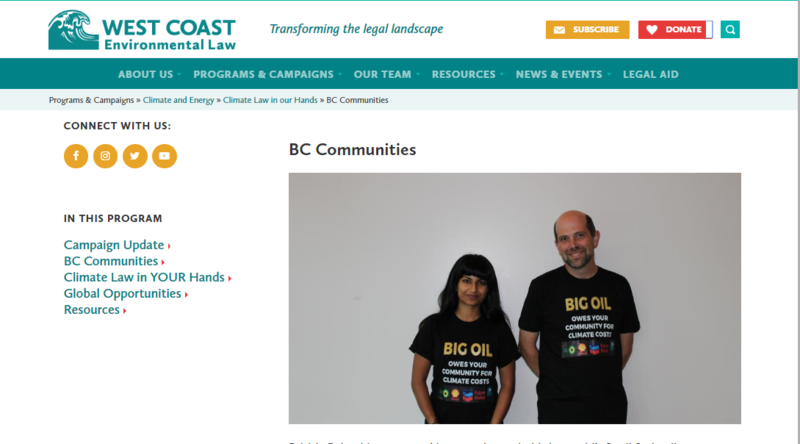 We also think the Competition Bureau should review these groups associated with WCEL’s “Climate Law in Our Own Hands” campaign. At its heart, this is an attempt to attribute responsibility for alleged global warming damages that have not yet occurred to one specific set of actors – the companies that produce fossil fuels. The proposal rests on several gaps in logic. First, no clear link has ever been established scientifically between carbon dioxide emissions from fuel combustion and global warming. Second, even if that were not so, the nature of the “damages” cannot be calculated on the basis of the climate changes that have been observed so far. They depend entirely on the quantification that is done by IPCC modelling of the effects of emissions many years hence. Third, as Ross McKitrick and other analysts have shown, the IPCC models “run too hot”, which is to say that the changes in average global temperatures that have occurred to date are well less than 50 per cent of what the models predict should have happened, and there is no reason to believe that their accuracy will improve in future. Fourth, even if it were possible to accurately measure the nature and cost of the climate changes that are due to human influences, it would be impossible to attribute the responsibility to any one set of emitters. To illustrate using oil as an example, 85 per cent of the GHG emissions associated with the oil fuel cycle occur at the final (i.e. combustion) stage. Only 15 per cent arises from oil exploration, development, production, transportation, refining and marketing – the parts of the life cycle for which oil companies can be considered responsible. Fifth, attributing to the fossil fuel industry 100% of the responsibility for a fuel cycle implies that consumption (i.e. combustion) is driven by production, whereas it should be obviously clear that production is motivated by the desire to serve the needs of consumers (i.e. customers). Apart from these failures of logic, this proposal is an obvious effort to “punish” one particular set of actors through the process of successively added layers of taxation. As I mentioned to you previously, oil (again, as one example) is now subject to government-imposed taxes and charges in the form of land bonus payments, land rental fees, royalties, corporate incomes taxes, and sales, excise and carbon taxes on the sale of final products like gasoline and diesel fuel. No other commodity that gives rise to GHG emissions is so taxed. The “Polluter Pays” principle is not only being contravened; it is being abused to the extreme. I could go on and on, but there is a very simple response to this nonsense. Ninety-eight countries now produce oil and gas and 25 produce significant quantities of coal. There is no way in the world that all these countries will institute special new taxes on fossil fuel producers. Those that did would simply be imposing an added cost burden on their producers that would place them at a competitive disadvantage relative to the producers in other countries and, in extremis, drive them out of business, leaving the market to the remaining producers, with no net reduction in GHG emissions. Since 2005, the ClimateWorks Foundation partners have had a plan to push a global cap and trade scheme and put $12 trillion of their vested interests in renewables on the grid world-wide. To accomplish this, they have spent some >$600 million a year for over a decade funding ENGOs. They split the world into five regions and began funding local ENGOs – many of those on the WCEL list of ‘climate law’ collaborators – to agitate for favorable policies on climate and energy for their vested interests, to make it appear to be a grassroots desire of local voters. This is an invasion of Canadian sovereignty and great damage has been done to our economy and people – as we have documented in this open letter to Finance Minister Morneau on the issue of charities and political activity. This appears to be a matter for the Competition Bureau – these ENGOs are being used as proxies for commercial benefits to their funders. It should be noted that West Coast Environmental Law was funded by one of the ClimateWorks partners, Oak Foundation, for $97,131., to create a legislated tanker ban on the west coast and thus result in the cancellation of Northern Gateway – a multi-billion-dollar project, felled by a foreign-funded ENGO ‘charity’. We note that the West Coast Environmental Law Research Foundation funded a report by Koskie and Minsky on September 1, 2015, which appeared to try and justify institutional investor interference in public policy – by this we mean direct interference. The document claimed that “climate change denial is not an option” and it was directed to pension fund trustees. We find this to be a case of circular, self-serving interests because several of the signatories of the letter to Premier Notley of Sept, 8, 2015,(Submission 107 ) are funders of the West Coast Environmental Law Foundation which provided the research funds for Koskie Minsky’s report. A few days after the release of this document, NEI Investments, a Canadian pension fund, and some 120 other institutional investors/sovereign fund signatories, delivered a letter to Premier Rachel Notley, essentially laying out a climate plan that they wanted her to follow. None of the things in the letter were in keeping with the interests or agreement of the electorate of Alberta. We explained our concerns in an open letter to NEI and their investors and delivered copies by mail to those parties we could find (of the 120 signatories). NEI Investments is signatory to the UNPRI – United Nations Principle for Responsible Investment. In 2014 they had conducted a “Montreal Pledge” wherein institutional investors agreed to be activists and to agitate that corporations and governments, particularly in ‘laggard’ countries like Canada, the US and Australia, be cattle prodded into ‘climate action’ by endorsing renewables. NEI was deemed to be one of the most active of signatories by the UNPRI in their 2016 annual report. We are deeply concerned about the potential for vulture investor activity through the pressures of the transnational, unelected, unaccountable UNPRI, as outlined in this letter to the Ontario Securities Commission. In this recent report, “Faulty Premises = Poor Public Policy on Climate,” we show how the IPCC is operating on faulty premises. Many of their proposed policies, like rapid decarbonization, would result in mass deaths. The ‘climate catastrophe’ promoted in the news (for headlines) and by ENGOs (as donation drives – “Give me the Money and I’ll stop climate change”) are based on a very unrealistic ‘worst case’ scenario that no credible scientist relies upon, as explained here by Dr. Judith Curry. In this brief for the Prime Minister, we explain why WCEL and Whistler are wrong on climate change. We hope the authorities will look into this “Climate Law in our Own Hands” campaign which is attacking essential services and the parties associated with it. We recommend revoking the charitable status of the agencies involved. Taxpaying workers should not have to support foreign funded organizations that are making spurious attacks on their jobs, their families, and the Canadian economy and confederation, operating under the ‘guise’ of charitable activity. To make it perfectly clear just how important oil, natural gas and coal are to contemporary society, we refer to the work of Blair King, “A Chemist in Langley” with a thought experiment about a world without fossil fuels. We hope you will follow the link and read the entire piece, showing the rapid breakdown in society absent fossil fuels. A thought experiment on what would happen if all fossil fuels disappeared tomorrow. Based on the foregoing, it is clear that West Coast Environmental Law and its affiliates in the “Climate in our own hands” campaign are literally putting society at risk of collapse. This is not a net public benefit and is a significant potential harm. This is contrary to the principles of an operating charity under the policies of the CRA as we understand them – that being that charities have the right to collect money and issue tax receipts (thus being subsidized by taxpayers) for them to provide a net public benefit and no public harm, as per Policy CPS-024. This campaign appears to be attempting to limit the activities of fossil fuel producing companies by creating and inciting unlawful resentment and hatred or fear of the company (through claiming the company’s activities are threatening humankind and the specific community) and by using this as a stepping stone to extort payments; if not at this stage, then down the road with a bevy of followers in a class action suit. While Vancouver has plans to go ‘100% renewable’ this is a multi-trillion dollar pipe-dream which Blair King again, exposes. To go ‘all electric vehicle’ – not to mention all electric heating for houses – about a dozen more Site C-equivalent dams would have to be built. As energy commentator Euan Mearns and colleagues report, to go all electric vehicles anywhere would require trillions of dollars of grid upgrades. As we have pointed out before, many of these environmental groups, like the David Suzuki Foundation and Smart Prosperity make many enthusiastic claims and lobby the government and hype their ideological ideas across society, but they do little or no due diligence. This results in costly catastrophes like the Ontario Green Energy Act. As a result, in order to be found charitable for the purposes of being registered under the Act, an organization’s purposes must be sufficiently similar to others previously recognized to be charitable at law. These groups are clearly basing their claims on false and misleading interpretations of climate science, they are ‘greenwashing’ the public, and they are making harmful accusations toward providers of essential products and services in Canada, apparently acting as proxies for foreign interests – possibly also affecting shareholder value. In this event, if proven, Section 380 (2) of the Canada Criminal Code may apply. We ask that you delist the charities involved and investigate the ClimateWorks Foundation infiltration of Canadian climate and energy policies. Policies found to be implemented based on this foreign interference should be repealed. We ask you to investigate this decimation of the Canadian economy by the ClimateWorks Foundation, its partners and funded ENGOs who are actively skewing markets and spreading false and misleading information on climate science and energy. Wow that’s a lot of information to digest but thank you for putting in the work. There’s a hydra of corruption going on right now and people need the curtain pulled back. I hope the government follows through with your recommendations. If they don’t a judicial review would be costly but I think it would win in court. Excellent forensic work. The leaders of these groups should be prosecuted for their treasonous actions!